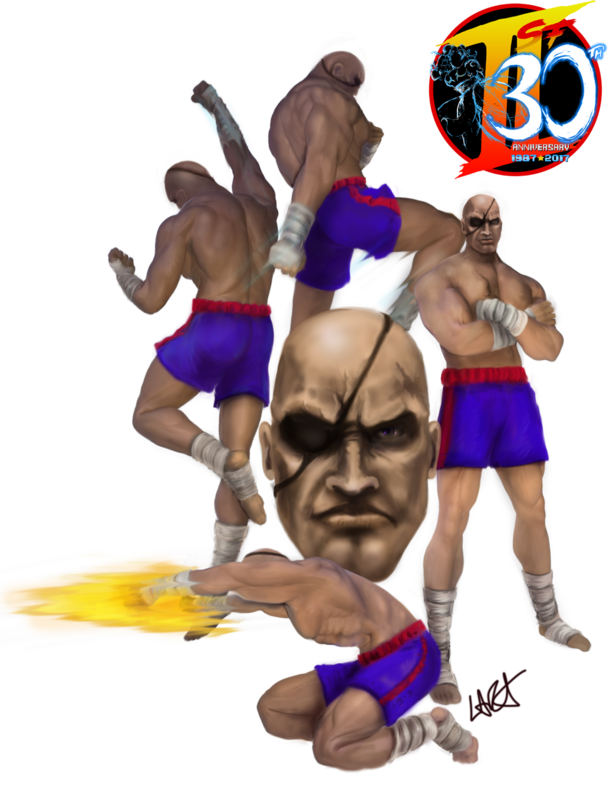 Our Street Fighter 30th Tribute: Sagat the Emperor of Muay Thai returned! Sagat the former final boss of Street Fighter I, made his return in Street Fighter II. Originally he was one of the four bosses the player faced after defeating the initial roster of eight fighters. In later editions of Street Fighter II he became a selectable character. Known for his long reach and changing projectiles at high and low angles, he proved to be just as menacing even without his former final boss status. His return in Street Fighter II was more insidious than his former Street Fighter I incarnation. He became one of the evil M. Bison’s henchmen; being the second-to-last character to face before Bison himself. And much like the first Street Fighter; both final battles take place in Thailand. His reasons for joining Bison and subsequently Shadaloo itself is for revenge. 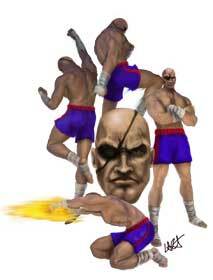 Revenge against the fighter who gave Sagat the humiliating defeat and large scar from Street Fighter I. That fighter of course was Ryu. Throughout much of the Street Fighter II series; Sagat’s personal hatred towards Ryu remains intact. It wasn’t until later on throughout the Alpha series that Sagat began to see through his blinding rage towards the Wandering Warrior. Sagat’s long reach, high and low Tiger Shots and devastating Tiger Uppercut made him a very fearsome opponent that only made the end goal of fighting and beating M. Bison further from inexperienced players’ reach. His very win quotes mock the players attempts, which more or less added on the incentive for them to plop more quarters into the machine and take down the “One-Eyed Giant”. 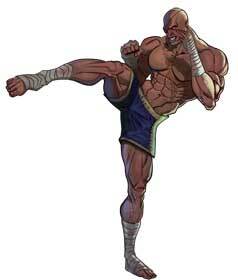 If there was ever one person who wished to take down Sagat for good though, it was his former pupil Adon. While Sagat’s hatred was towards Ryu over his loss, Adon’s was towards Sagat. Adon swore he would dethrone Sagat one day and take his place as the New King of Muay Thai. 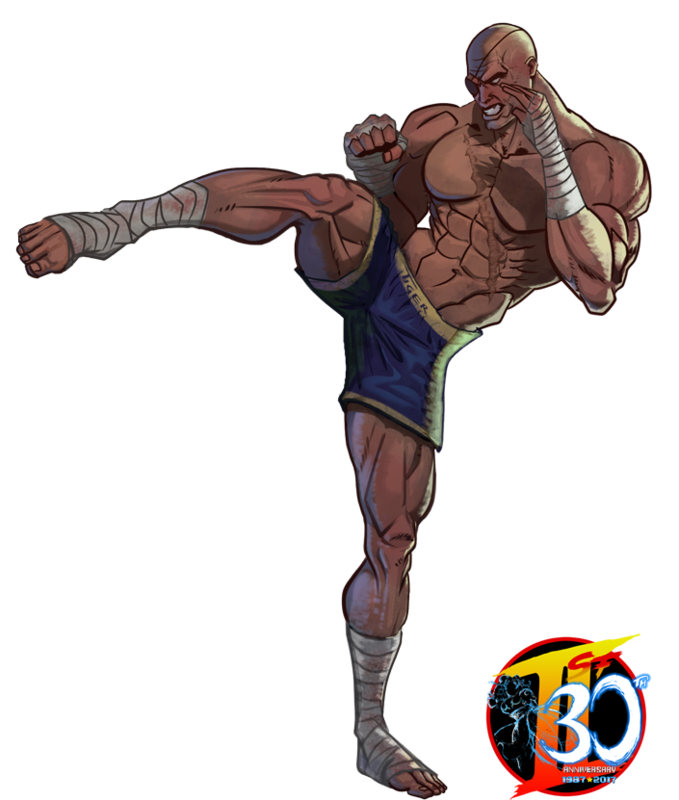 One thing is for sure; Sagat was soon dethroned as the “Tallest Fighter in Street Fighter II” when T. Hawk made his appearance in The New Challengers. Lara C. from the UK (of course!) is a part of the Game-Art-HQ Community now since years and participated in the majority of our projects with mostly very unpopular games and game characters, did you expect someone would claim Quake 64 as example when games like LoZ Ocarina of Time etc. were available as part of our Nintendo 64 Anniversary Tribute? Her takes on Gen from the classic Street Fighter and Sagat from SFII are her currently last submissions but you can be sure there is more to come. Androsm is an artist who hails from Spain. Absolutely amazing artworks are produced from him as his remarkable rendering skills flesh out an amazing array of characters from both video game and comic book lore. His rendition of Sagat is truly a testament to his sense of lighting and scale as he brings the King of Muay Thai to life in such a dynamic way. Highly recommended you visit his DA page.